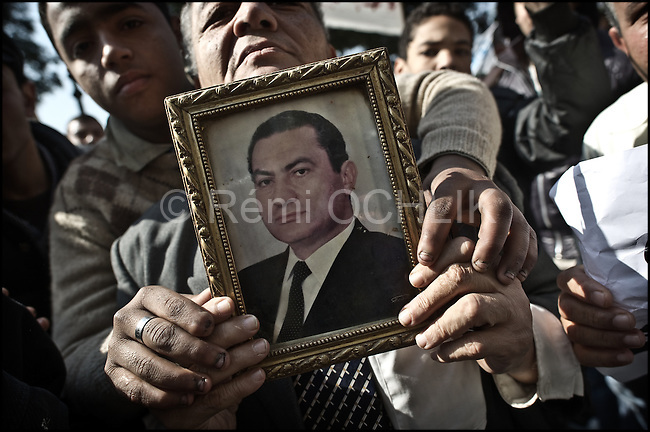 © Remi OCHLIK/IP3 - Cairo Feb. 02 -- Pro Mubarak Egyptian show the portrait of their president...Since the beginning of the day pro Mubarak protestors are gathering in the streets around the Tahrir square. .Chaos consumed Cairo's Tahrir Square on Wednesday as supporters of embattled Egyptian President Hosni Mubarak clashed with opposition protesters in running battles that left hundreds of people injured. Two molotov cocktails thrown by pro-regime supporters landed inside the grounds of the world-famous Egyptian museum, where they were swiftly put out, as a medical source said at least 500 people had been wounded in the clashes. The square, a focal point for nine days of anti-government demonstrations, was transformed into a war zone, with protesters lobbing hundreds of stones at each other as the army fired warning shots into the air.